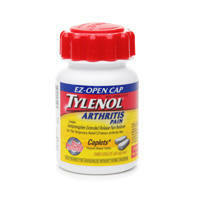 Tylenol a medication designed to treat Arthritis has expanded its recall! The Tylenol recall expands to include Tylenol Arthritis, issued by the FDA. Tylenol is a top Medication that is used in several forms and medical conditions. It is one of the top medications used both in over-the-counter and with combinations with other medications. The recall began in November because of a smell that has been described as “moldy” or “musty“. It is believed that this smell is caused from a chemical called “2,4,6 tribromoanisole“. The overall health concern remains unknown and studies have not been performed to see if any health problems may result. It can therefore be assumed that, at this time, the large majority of the reason for this recall is smell alone. *** – These symptoms appear to only last for a short period of time. The bottle for this medication is unique to this brand. Johnson & Johnson has produced a E-Z bottle top that is bright red. The top is larger than a typical top and Caplets of 100 per bottle are seen. It is recommended that you stop taking this medication immediately and contact the company for the return and refund policy. This is a medication that I use. I have finished my bottle and didn’t notice any problems. I was going to buy some more. Should I be concerned and should I wait?